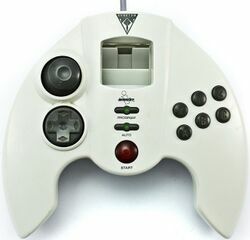 The Quantum FighterPad is a third-party controller for the Sega Dreamcast created by Recoton and distributed under their InterAct label. It is a programmable but otherwise no-frills controller for the console. InterAct also bundled Quantum FighterPads with TremorPaks later in the console's lifespan.